T-Mobile’s new Value Plans launch next week and third-party retailers are ramping up with new training docs and guides to help employees with the transition. 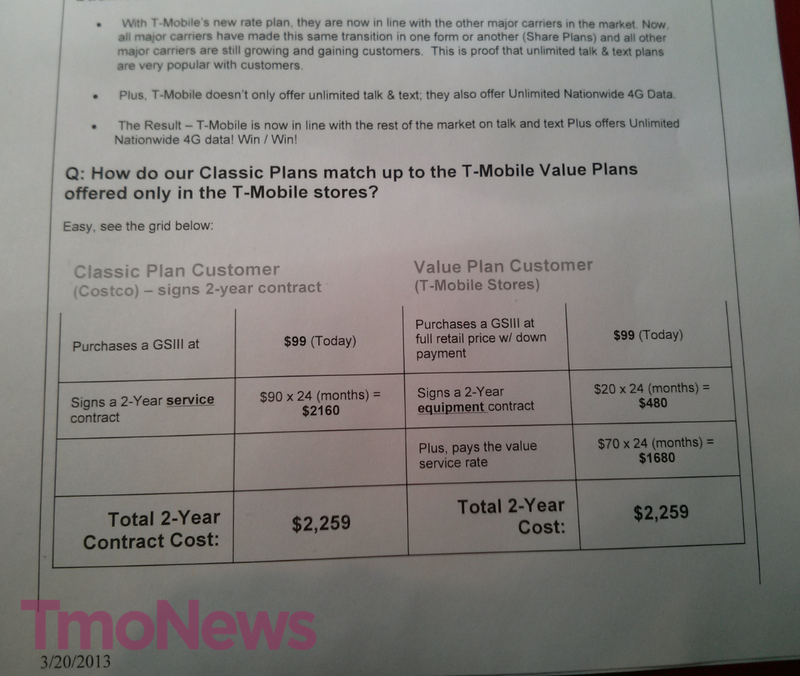 Given that T-Mobile’s company owned retail stores are moving to Value Plan only environments, national retailers are showing off the cost comparison with the new Classic plans. There are a few discrepancies listed here however, specifically since we learned yesterday the price of the Galaxy S III in company owned stores will be $69.99 and not $99. Second, no two-year equipment contract will be required with T-Mobile’s new Value Plan structure which may or may not be a notable difference to some. Unless I’m missing something, Costco’s document is pretty convincing that until you pay off the handset, Value Plans and Classic Plans can cost similar amounts. The real advantage may lie in T-Mobile’s trade-in program which will allow customers to put the trade-in amount against the overall cost of the device. Anyway you look at it, a trade-in should offset some of the total 2-year cost as CostCo words it establishing a clear advantage of the Value Plan side. Surely you’ve got a phone lying around you can get rid of to help offset some of the balance, right? So where do your opinions lie, are you moving into the Value Plan camp? They should point out that the monthly drops to the Value Plan service rate after the 24 months. So, if you don’t need a new phone, you continue at a lower rate. Under Classic (and other carrier plans), you need to get a new device as soon as you get the subsidy or you are throwing away money. No, it just depends on current needs. Sometimes a new phone will come out, with features that I want, so I will get a new phone wen the contract ends. Otherwise, I am happy to keep my present phone. Also, I know that I only want to spend $50 a month for phone service. With the new plans,, I will be spending at least $65+ for 2 YEARS!!!! I also know that I am only going to spend x amount on a phone—period. so a phony $X DOWN means nothing- BECAUSE I know I will still be paying money on a phone for 2 years. So basically this plan limits me to an old phone that will probably A) not be upgraded and B) will probably be discontinued very soon( No new parts availably IF I have a problem) Don’t think tthat this will get more customers in the long run. I think you’re missing the point. It’s not weather or not you need a phone at the end of the contract, it’s the fact that on classic you will still be paying subsidy plan pricing after 24 months where on value you have the liberty to pay off early and be off commitment. And as far as phone life, this is the same for either plan and on any carrier. You’re paying for that 6 month life spam phone one way or the other. When has this been any different? Ask Costco to do an upgrade in the first year. You can’t without paying a full unsubsidized price. Value gives you better flexibility every which way as you could pay off what you owe (less than full price because you’ve made payments) and continue paying the same thing you would like on a classic plan. Long and short value is better for most people. I’m going through this same situation now. I was using a Tmobile Wing as of 2 weeks ago (out of contract). I was given a Moto Cliq (tmo). I put my sim card in to use it. I get talk and text but no internet. The store clerk told me to call tmo so I did. Tmo said that i have to sign another contract to get new data plan. Why. My contract is pre 2008. I’d like to keep it. Everything I see offered by tmo cost more and I get less. Why sign a new contract when I’m bringing my own phone? Oh yes David, the trade in program. Because I couldnt sell my phone on craigslist/ebay/xda and make the same or more. Value plans are a wash. Some people will like the immediacy of doing it right then and there, even if there is a little less money involved. For some, convenience will be more important. Also if you have a phone that works but has issues, you can’t sell in good conscience, but you can trade in. Good point. When I got my GS3, I considered selling my old G2x on eBay, but I couldn’t find the heart to foist that POS on some unsuspecting schmo. And that’s awesome that you can do that. It is still nice to have the option to trade in as some people don’t feel comfortable selling their phones. When did more options become a bad thing? I just picked up the Nexus 4 from google play store. Price is only 299 and shipping is within a week. This phone is amazing-super fast, smooth screen navigation and it’s yours. You just dont have all of the carrier bloatware. Granted you can’t trade in you week old galaxy s2 for 75 bucks for that new $700 smart phone. Buying the nexus 4 outright from google and putting on a value plan is where the real value is to be found. PS if you bring your own device to the party you don’t have to have the higher end data plan. Now that’s true value. why would I buy this phone that has a fragile glass back. non removable battery and no SD card!!! Epic Fail!!! Geez Jake, Iphome has a fragile glass back, no SD card and a non renewable battery but continues to be wildly popular – some might even call it one of the most wanted phone. is the Iphone an epic failure because of glass back, no SD card and non-removable battery? Seriously? And I like to download mixtapes from the web, these are sometimes zip files. I can unzip them right on the phone and listen to it right away. The iPhone may be popular generally, but there are many of us who prefer other phone makers for these very reasons (among others). Not if you buy Nexus 4 straight from Google. 8 Gb version for $300 is fine. yes, unless every phone on there is a new smartphone. I’m saving crazy money on my value family plan now, but that’s only b/c my parents and inlaws do no require a smartphone. I don’t know why anyone would trade in a phone unles they are lazy. You can get far more for a device on ebay. The value plan is better for anyone who brings in their own device, buys it outright, or buys a cheap device. is the costco 90 plan unlimited everything? It’s not really misleading. It clearly states in the first section the customer is purchasing a GSIII (Galaxy S3). They are using that particular phone purchase to drive their scenario. I guess if you’re an idiot, you wouldn’t be able to see past that. But then, good luck with your life. So no contract and cheaper upfront cost, combined with the trade in credit. Value really is the way to go. Even cheaper if you just buy the phone from ebay or craigslist. You pay a higher rate on those phones, with a value plan, once your phone is paid, you don’t pay a higher monthly rate. Seriously though, who pays more than $300 for a phone. With the recent imei blocking that’s going on with carriers -Craigslist and eBay may not be the best place to get a cell phone. You could get a nice phone for a reasonable price, however, the imei could be blocked a day, a month or even further out if the person you buy it from doesn’t pay their bill, reports it a stolen or is selling their reported stolen phone to file an handset claim. Craigslist is typically a cash only purchase so you can’t even stop payment or report it to your credit card company. BE CAREFUL or you’ll have a nice new bricked phone. Problem is, I’ve NEVER seen a good valued trade in program. Ebay is the best place to maximize your sale of your old phone. I think T-Mobile will will value the HTC One S at $100, these phones are still selling in the $250 range on ebay. That $50 isn’t chump change (to me at least). You also pay tax on the full price of the device with the Value Plan whereas on the Classic you would only pay tax on the subsidized price. At least in NY. On Classic you’ll pay an upgrade fee so it’s basically a wash. I believe in Costco waives upgrade fees, and they offer a $20 worth of freebies like car charger and stuff. True but this is somewhat offset with upgrade fees. And in Florida our state tax is 6% (plus some county taxes if applicable) but our cell phone bill taxes and fees equal around 19% when said and done. That means I’d rather pay 6% up front for the phone instead of 18-19% on the bill for $20 a month. Basically unless your state communications taxes are less than your local taxes then value wins again. Let me clarify… I mean the $20 extra of the plan is taxed higher for us. The $20 on the phone is lower taxes up front. And if you happen to choose a phone that isn’t $20 a month another win. actually, not to be a buzz, kill our taxes in Florida are around 21% total when you account for all the fees. If you’re lucky to live in Delray Beach you also get a “pole tax” courtesy of the city. I need a new phone and qualify for upgr in April, so I’m probably in for whatever. My current phone is too sick to trade in, but i have an older one I may pimp out for a little break. Unless someone wants a G1 with a fresh battery. Didn’t think so. I don’t think that Costco is being stupid here. The purpose of the training document is for the plans that are coming; I’m sure that they are already trained on the plans that they have now. Plus, Costco is concerned more with the customers that upgrade their phones (at least) every two years; they get their money from the contracts, not the service fees like the carrier does. I had been excited by this early on, but as I understand it, Value plans are still contractual, right? That doesn’t seem to really help much in the grand scheme of things because phones (aside from the Nexus line, maybe) are so expensive. yes and no really … if you want to end your service there’s no penalty .. you’ll just have to pay the cost of the phone remaining assuming you had a phone on an equipment plan .. so if you don’t have a phone you’re paying on, you can just get out with no penalty .. that’s the beauty of going no contract and instead using equipment contracts i guess. Wait, so the value plan has no contract on it? Why would I ever do 4g monthly anymore (or is that being phased out?). I guess I’m confused because of the current value plan states up to a $200 per line cancellation fee. You’ll still need to pay off your phone, if you bought it on the equipment plan. They’re not going to let you walk away with a serverly discounted smartphone. IMO, the cheapest approach would be to buy a gently used phone on ebay and buy the value plan (today, not the upcoming one), and you’ll always save money over 2 years as long as you don’t switch phones. yeah, I’ve factored in the phone pricing myself. I will continue to go Nexus so long as google offers a $300 option, heh. Even a $500-$600 phone.. worst case, I don’t save money vs contracted plans, but at least i’m supporting no contracts. If these new value plans indeed have no contract tied to them, that would be great. I hope it “no annual contract” is hidden to mean hardware side only. Yeah, good plan. I indulged myself, sold my HTC One S on ebay and bought a Note 2 on Ebay for $500. I have to have LTE and the goodies that come with Note 2. The features of the phone will not be outdated for a good 3 years, based on what I need it for. David: The second “c” is not capitalized on Costco. I don’t know why I thought it was, fixed! Thanks! 1. You can get a new phone as soon as you want with no penalty. If a great phone comes out in one year — you’ve already saved $240 plus tax and fees to put toward purchase; and you don’t have to buy it from Tmobile. 2. Keep your phone more than 24 months, and you come out ahead. Like computers, phones are getting to the point where the compelling innovations to get a new on are decreasing. Keep your phone for 30 months and you’ve got $120 toward a new phone. 3. After 24 months, no need to re-up to a new contract. If you’re unhappy with T-mobile, just leave, or use threat to leave as leverage for better contact, discount on phone, etc. If you’re okay with it, just continue to pay. – If there is a device that comes out before the 24 months are up that you want, you can either pay off your remaining balance or trade in your current device towards the new one. With Classic you have to pay full retail price if you want a new phone before the 24 months. – Also not every phone will be the full $20 per month, just the highest end ones. Value could come out a lot cheaper for those who don’t need the latest and greatest. – Taxes on your bill are lower because you’re paying fees and taxes on the $70 and not the installment whereas you are charged taxes on the $90 rate plan for classic. The only time I can see people coming out on top with the Classic plans now are if they buy their phones when retailers like Costco have sales like $100 off or $0 upfront. you don’t pay the taxes on the $20 equipment charge that you pay on the increased classic pricing which can be up to and exceeding 20%… value is a better value. The real Q is, what will be the ETF charge to get out of the costco classic plan and move to a value plan. i.e. is the ETF more than $240? they start at $200 per phone and go down depending on how long you’ve had your phone. The value plan phone payments will not be for the entire 24 months, but rather only 20 months. Thus, this cost comparison chart isn’t an accurate representation of anything. It will be cheaper over the course of 2 years on the Value Plan. With the new Value plans the EIP’s are 24 months now. No more value plans at Costco?I bought a HTC One S at Costco on a value plan for $339.99 on 4/25/2012 . I did have to sign a 2 year value plan contract,but still saved a lot on the price of the phone. So, you pay $480 more for the phone and get $20 cheaper rate on service. Break even in 24 months. Seems like a win-win deal, IF you just have one line. The plans are live. Instead of speculating, why not just have a look at their web site? If I spec a four-line plan with 2 GB of data each, the price that comes up is $120. Add four $20/mo EIP payments, and you get $200 per month (it’ll be less, of course, if someone opts for a lower-end phone, but let’s assume everybody gets a GS3 for the sake of argument). Per the Costco plans, as listed here (https://www.tmonews.com/2013/03/t-mobile-new-classic-and-prepaid-plans-classic-available-at-all-national-resellers/), a 2-line Classic plan with 2 GB each is $140, and additional lines are $40 each. Thus, a 4-line Classic plan with 2 GB of data each would come out to $220. Costco offers T Mobile? Since when? I’m in my Costco weekly and T Mobile has never been offered. Must be a N Idaho thing. Anyone else think that $90 for 1 line with data is too much? I am still on a grandfathered classic plan and I’m paying $200 for 4 lines, all with unlimited (10GB cap) data and more minutes that I can use.